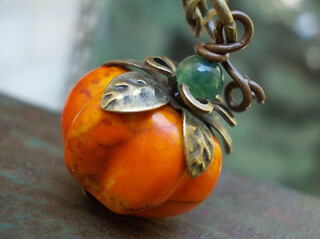 A carved howlite rustic stone bead (14mm x 10mm), in orange with organic spots, capped with antiqued brass petals, and a small natural moss agate stem. Strung on a 18inch long antiqued brass chain, that closes with a lobster clasp. The last picture shows Hodaya wearing a similar necklace.